Craney Island – Chesapeake Chapter U.S.L.H.S. Photo courtesy U.S Coast Guard (1884 lighthouse). The first permanent lightship station in the United States was anchored in 1820 in the lower Chesapeake Bay on the west side of the channel near the mouth of the Elizabeth River to guide vessels approaching Norfolk & Portsmouth harbors. This lightship was originally stationed at Willoughby Spit, but bad weather and sea conditions proved to be too harsh. In 1857 the Lighthouse Board recommended replacing the lightship with a small screwpile lighthouse to be constructed at a cost of between $10,000 and $12,000. Craney Island Lighthouse replaced the lightship in 1859. It was a square screwpile lighthouse that housed a fifth-order Fresnel lens and Franklin lamp which exhibited a fixed white light with a machinery operated fog bell. In 1861, the Confederates removed the lens and destroyed the lighthouse. All that remained were the nine foundation screwpiles. A temporary light was installed on the remaining foundation until the lighthouse was repaired and back in operation in 1863. In 1883, it was reported that the lighthouse had started to decay and needed to be replaced. Construction of a new lighthouse started in August at Lazaretto Depot and was completed in January 1884. The new hexagonal superstructure was placed on the lighthouse tender Jessamine and delivered to the site and placed on the old screwpile foundation. The first floor of the lighthouse included a kitchen, sitting room, bedroom, and storeroom. The second floor had one bedroom and room to house the fog bell machine. It was equipped with a fifth-order Fresnel lens and Franklin lamp. The characteristic of the light was changed from a fixed white light to a flashing white light every five seconds in 1898. It was not unusual for women to serve as Keepers or Assistant Keepers with their husbands, but it was not common for the women to be paid. Over the years, Craney Island Lighthouse had at least three husband and wife teams tending the light. Solomon Mister ($600/year) & Mrs. V. A. Mister ($400) served from 1865-1870. William Sturtevant ($600/year) & Mary Jane Bell Sturtevant ($400/year) served from 1870-1873 and Elisha Richards ($540/year) & Phoebe Richards ($420/year) served from 1873-1879. Craney Island Lighthouse saw its share of heroic lifesaving measures through the years. In 1918, Assistant Keeper J. E. Stubbs rescued three young men from drowning after their small boat capsized. In 1917, Keeper Charles A. Sterling rescued members of the crew from the yacht, Joan III, out of Norfolk, Virginia from drowning. On July 26, 1924, the steamer Gratitude struck a sunken scow and sank shortly afterward. Keeper Sterling was first to arrive at the scene and rescued 12 of the more than 200 passengers who had jumped overboard. On December 29, 1927, Defiance, loaded with cotton caught fire. Once again, Keeper Sterling rescued five crew members. After bringing them to safety at the lighthouse he returned to rescue another man that was unconscious. After administering life-saving measures, the man fully recovered within a few minutes. Keeper Sterling was awarded two silver lifesaving medals by the Secretary of the Treasury for his heroic measures. The first was awarded in 1925 and the second in 1928. 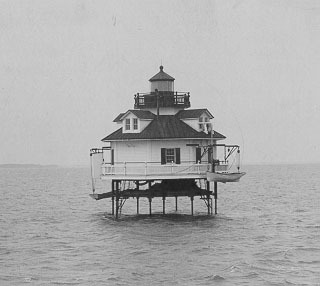 The lighthouse was deactivated in 1936 and replaced by an automated light mounted on the original screwpile foundation. That light was removed in the early 1970’s and replaced by a buoy. 4. Report of the Commissioner of Lighthouses, various years. 5. Official Register of the United States, various years.